I hold the 1972 Radio Shack guide: Building Speaker Enclosures. Ask me anything. Discussion in 'Shock Brother's DIY Amps' started by andyfromdenver, Nov 16, 2013. Book by Robert G. Middleton. lol, a "for fun thread". My electronics friend gave me this last night and it's full of super friendly and digestible info and methods. I need to scan it in. In the meantime, I'll post the table of contents and would photo/quote any sections of interest. I have access to a free scanner and can assemble in PDF, if you need help. Is it protected by a copyright? If it doesn't specifically say "copyright" in it, it's public domain since it was published before '77. If it does say "copyright" in it, it's protected for another 55 years. Haha! Ok, it does state "copyright"
Well, I can re-phrase or whatever. Like, didja know. Given two speakers of unequal impedance (4ohm and 8ohm ex.) Wired in Parallel, the 4ohm speaker will draw more power. Wired in series, more power will be drawn by the 8ohm. There's handy info about crossovers too; capacitor values and coil values. I have a second edition, copyrighted in 1988, 1991. I've got the same book, found it at Half Price Books a few years ago. Some useful info, but the build quality (maybe more accurately, style of construction) of the enclosures isn't to my liking. At least not for vintage style amps or speaker cabs. Back in the day, I bugged Altec, JBL, and EV for plans, didn't know that I could get some from Radio Shack! Chapter 4 - "Speaker Enclosure Columns" the only way to rock! Haha!! When guitar rock was king. Now excuse me while I take my iPad and a bunch of stolen software to my next sold out gig!!! If you like vintage books and are interested in measuring the Thiele Small parameters of your speakers, a much better book is "How to Design, Build & Test Complete Speaker Systems by David B. Weems. The hi-fi designs are very basic, especially in terms of passive crossover design. And in terms of the testing, it is pretty dated in a day where we use SMAART-TEF etc to measure our systems, but the book does an outstanding job of explaining how speaker systems work. If you are using sealed or vented enclosures, this book will help you design an enclosure that works with a specific speaker to deliver a specific response. here's me with 2 12's and 4 15's - all home-built Radio Shack specials! @jhundt, thanks for sharing that cool pic, you look like a total bad a$$ . 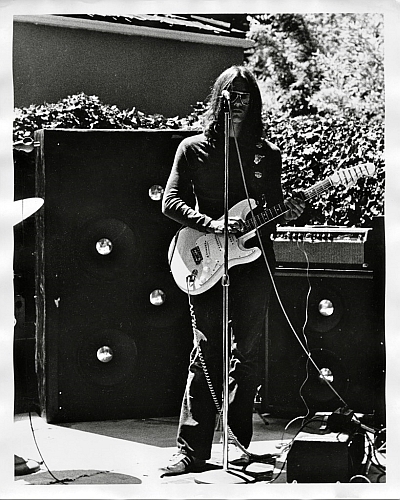 Is that a Bassman and some nice old strat? Pro gear, including the awesome DIY speakers. On a lighter note, the saying, "pro gear, pro attitude"... Makes me lol for some reason. Now that I've spent some time with it, I must agree . Not a holy grail item/relic for sure. Andy - that photo is from 1972. I'm playing my '68 Strat thru a '66 (?) Blackface Bassman. On the floor is a Blackface Bandmaster that we used as a PA amp that day, mixing the mics thru a little 5-dollar Calrad passive mixer. Not visible are the two humongous home-built Altec A7 "Voice of the Theatre" PA speakers. Very primitive by today's standards! is "mojo" the official marketing term for "lots of capacitance"?